This morning Harvey Norman have launched Harvey Norman Big Buys. It's a daily deals site that's pretty much identical to Catch of the Day and DealMe. 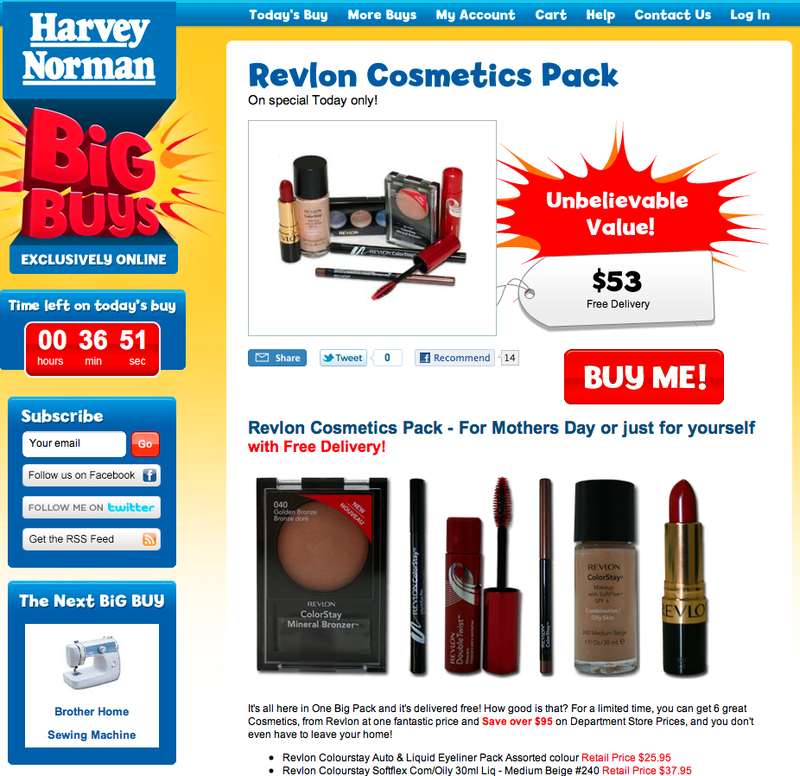 I actually drafted a blog post a couple of days ago discussing how I thought Harvey Norman's online strategy wouldn't work given I thought they were likely to just replicate their offline store experience online, so hats off to them for not doing that and thanks to them for launching their Big Buys site before I published my post! ;) It's great that Harvey Norman have recognised replicating their offline experience online won't work and that they're exploring other paths for online retailing. That said, the site could certainly use some improvement, the design and colour scheme strikes me as ugly and I'm not sure how attractive the products on offer are. Replicating exactly what others have done before them doesn't earn them an A+ for innovation either. Still, it's their launch day so no doubt those issues will be improved. Incidentally while checking out Catch of the Day and DailyDeals for this post I ended up buying 8 headphones from Catch of the Day and a case of wine from DailyDeals for our new office. Both sites have great offers. What are your thoughts on their site? Sometimes ugly is good, as long as it's clean. The products they've featured so far haven't appeared very tempting. It might be a way for them to get rid of remnant stock, but unless they offer better quality deals i don't think it will be a profitable move for them.